Hello, friends, and welcome to Episode 3 of The Greg Amundson Show. This show originally was intended to air on the first and third Sunday of every month. However, this month we had an extra Sunday and I did not want two full weeks to go by without having an opportunity to continue the momentum of the show that we are establishing. So in many respects, Episode 3 is a bonus episode, and what a bonus this is going to be, my friends, because I am really excited about the message that is going to be contained in this episode. In this episode we are going to introduce and begin the study of an extremely important topic. That topic, my friends, is understanding the nature of law. There are essentially two types of law that exists in our awareness. The first type of law is very easy for us to understand. That is the law that has been established by you and I, the law of man. Anyone serving in a law enforcement capacity understands the nature of law. We have to abide by law and there is an entire profession that has been established to enforce the law that man has created. The other type of law is much more important than the law that you and I have established because the other type of law has been established by God. Now, I say that with a great deal of respect for the law enforcement officer who enforces the law of man because I am still in the law enforcement profession. For 16 years I served in a full-time capacity as a law enforcement officer and I used to love to learn all I could about the law that had been established by man because as any good law enforcement officer knows, the greater understanding a law enforcement officer has of the established law, the greater effect they will have in enforcing and in investigating the law. Well, my friends, what could be more important than understanding and aligning our self with the law of God. It’s my contention that nothing is more important than understanding God’s word. And when we understand God’s word, what we uncover within the word of God is the law of God. So we’re going to begin this investigation today by introducing two of these laws which God has established, which God has created and which God so much is desirous of you and I abiding by. And here’s the reason God wants us to abide by his law. God wants us to live in a state of grace, a state of abundance, a state of prosperity, a state of health, a state of love, a state of joy, a state of bliss. That is the state that you and I were born to live into. The reason that so often we experience during the course of our life disease, disharmony, sadness, despair, anxiety, stress is that whether or not we realize it we’re breaking the law. Not man’s law, God’s law. And here is the key detail, my friends, that we establish right away during our investigation of law. Whether or not you and I are aware the law exists is irrelevant to the fact that if we are in alignment with the law we experience joy, happiness, bliss, abundance, and if we violate the law we experience the equal and opposite of that. Here’s an example of what I mean by this. When I was serving with the Santa Cruz County Sheriff’s Office as a young deputy sheriff, I used to love to conduct vehicle enforcement. I would stop a car because I was well versed on the vehicle code law and if I noticed that there was a violation of the vehicle code law, I would stop the car with the intention of educating the driver on the rule or the law they had violated. And what I found used to crack me up because as I approached the car and as I did my best to explain to the driver as kindly as I could the reason that I stopped them, nine times out of ten here’s the defense the driver has for me: “Well, Deputy, I didn’t know that was a law. I didn’t know I could not conduct a U-turn at that intersection.” Well, sadly, not knowing that they had violated the law is not a defense that’s been agreed upon by you and I for violation of the law. Just because we didn’t know it was the law does not allow us to break the law. Either way, we will experience the repercussions of violating law that has been established by you and I. Well, my friends, it is the exact same thing when we violate the law that has been established by God. So the two laws that we introduce today are the law of repetition and the law of order. I’m really excited about the law of repetition because this law is very easy for you and I to understand because whether or not we know it, we have been practicing the law of repetition since the day we were born. Everything that you and I have learned up to this point in our life, we learned through the law of repetition. The key to understanding the power of this law is that everything that we repeat we learn. However, in the establishment of law there were no conditions placed upon the law that God created. So whether or not we are repeating thoughts, words and actions that we are desirous of experiencing in our life is irrelevant to the fact that if we repeat it enough times we will learn it. It will become part of our nature. It will become part of the person that you and I grow into. Let me read to you one of the devotionals from my book, God in Me: Daily Devotionals for a Heart Like Christ, because this particular devotional I think does a great job of laying out the significance of repetition and it emphasizes what of course is the most important use of repetition in our life. This particular devotion is from May 18th. Here we go, my friends. The Word of God is alive with power, potential and strength. Bible verse repeated both out loud and in the silence of your mind has the ability to heal your heart and restore your weary soul. The more often you repeat God’s word, the greater his word will be in your life. With any new skill, repetition is the first law of learning. When you have repeated God’s word so often that his voice plays like background music in your mind, then you will have progress. Grace will become your natural state of being and you will increasingly grow in the likeness of Christ. Let me repeat one sentence that’s so important from this devotional: With any new skill, repetition is the first law of learning. Isn’t that just wonderful, my friends, to realize the power that you and I have. If there is a skill, whether it be a physical skill or a mental skill that we’re desirous of learning, all we have to do is begin to repeat that thought process or that behavior, and then over time, through repetition, we learn the behavior or the thought process that we have been repeating. I just love learning about law and the law of repetition is such a wonderful law to understand and embrace and respect and appreciate because everything that we’re introducing during our time together here on The Greg Amundson Show can be learned through repetition. Repetition is going to be ultimately our best friend, our greatest ally, our constant companion. My friends, as I’m sure you know I am really passionate about sharing the profound wisdom that has been handed down to me by the incredible mentors in my life. Today I’m excited to share with you and introduce you to two mentors that I have not spoken a great deal about in a public setting, yet all of that is going to change because it recently dawned on me just how indebted I am to these two remarkable men. The first gentleman I want to introduce you to, his name is Ken Gray. Sadly, my dear friend Ken has passed away. Yet, the legacy and the knowledge that he left me and many of the other students that sought him out for higher education lives on. So it’s my great pleasure and honor to essentially continue the legacy of Ken and the profound wisdom that he imparted to me. Those of you that are avid readers, I’m sure that you may have come across a book called Think and Grow Rich by Napoleon Hill. That is an amazing book, life-changing book. Well, to put the power, the wisdom, the knowledge, the credibility of Ken into perspective, Ken was a first generation student of Napoleon Hill. Wow. Ken was also a long-time student of Bob Proctor, who was another profound teacher. So Ken, my friends, was just an amazing man. I used to love to spend time in his presence. He was in many respects a grandfather to me. One of our favorite meeting locations was the IHOP Restaurant on 41St Avenue in Capitola. Ken, for some reason, was adamant that IHOP served the best coffee. So we would meet there for a cup of coffee and we would dig into the Bible, into the word of God and into some of the other great texts that are based on the word of God. One of those texts was, of course, Think and Grow Rich. Another phenomenal book that Ken introduced me to that we studied for approximately two years together — that’s the depth of knowledge that these books contain — is a book by Raymond Holliwell called Working with the Law. This was the book that is in many respects the penal code of God’s law. This lays out the law that God established section by section with a great deal of detail. Ken was the person that really inspired me to embrace the law of god, in particular the law of repetition. Because you see what repetition does in our life is repetition focuses our attention. As I taught for years in the CrossFit Goal Setting Course, one of the rules that we established in the first hour of that course is the rule of awareness, and that rule dictates that whatever we pay attention to will increase in or life. Repetition allows us to focus our attention. Therefore, whatever we are repeating in our life will expand, will grow, will become stronger, and those thought processes or actions that we do not repeat and thus turn our attention away from will not grow. They will ultimately fade away. So the law of repetition can be used to our advantage. If there was something that we want to increase in our life, we simply need to repeat that way of thinking or that way of acting, understanding of course the way of acting, understanding of course the hierarchy in the way these things are laid out in our life. Everything begins and ends within the temple of our mind, and if we should discover that there is an action or an established habit in our life that we are no longer desirous of maintaining and nurturing, we simply need to stop repeating that behavior and that thought process and immediately replace it with the activity, the action or the thought that we are desirous of increasing in our life. So this law of repetition is extraordinarily powerful, yet extraordinarily easy to understand. And that’s the kindness and the graciousness of God is he wasn’t trying to trick you and I, he wasn’t trying to create a standard or a law that we could not abide by. Quite contrary, God established law that you and I could easily abide by once we understand the law. The other incredible teacher and mentor that I want to introduce to you today is a gentleman named Londale Theus. I just cannot begin to speak highly enough about Londale. This guy is the man. Let me take you back in time and I’ll introduce you to the manner in which I met my dear friend, Londale. In the winter of 2001, December to be exact, I met on a cold winter morning none other than Coach Greg Glassman, the founder of CrossFit for my first CrossFit workout. Well, five days later, I am in Santa Monica, California at Krav Maga Worldwide. I was serving at this time in my life as a deputy sheriff and I had heard that Krav Maga was a very effective defensive tactics and martial combative system for law enforcement. So I found some information on Krav Maga and realized my goodness, the headquarters in the U.S. is in Santa Monica, about five hours south of Santa Cruz, I’m going to go take an introductory course. So I drive up to Santa Monica for this course and I checked in and I’m greeted by Londale Theus. And the moment I meet Londale in the same manner that in the moment I met Coach Glassman I just knew that God had ordained that meeting. That was an ordained meeting. That was meant to be, both the introduction to Coach Glassman and the introduction to Londale Theus. I assure you, my friends, that was meant to be because Londale had some profound wisdom to pass on to me. So much of the journey and the direction that my life began to evolve is based on the influence of Londale, an amazing man. And I know that many of you in the law enforcement profession have likely heard of or perhaps even been blessed by the opportunity to learn and to train with Londale. And anyone that has met Londale says the same thing. This guy is a man’s man. He is a warrior’s warrior, a profound, profound instructor, a great guy. One of the things that I really learned and appreciated form Londale is the martial arts principle of constantly emptying their cup or emptying their mind. Imagine if you had a cup full of water and it was filled to the very top, you simply could not pour any more water into the vessel. Well in the same way, if we lived under the assumption that our mind is full, that we’ve learned it all, the universe could be attempting to provide us some incredible information, yet, our mind is full, the ego is full and we’re not going to be able to receive it. Well, what Londale taught me was the opposite of that. He taught me that we constantly have to be emptying our cup and so it can be filled back up. Londale practices what he preaches even to this day, and let me show you what I mean by that. About three weeks ago, I was back in Santa Monica. I returned to Krav Maga Worldwide on a nearly monthly basis to continue my education in the martial art I’m so passionate about which is Krav Maga. There are four rooms at Krav Maga Worldwide. One of these rooms is a CrossFit room. Well, on this particular day, my class is gathering in a dedicated Krav Maga, Room 2. Yet, in order to access Room 2, you have to walk by the CrossFit room. I walked by the CrossFit room. The lights are off. The doors are closed. Yet, I see someone practicing what looks like rudimentary capoeira. I looked a little bit closer through the window into the CrossFit room, and lo and behold, who is in there learning at a later stage in their life a brand new martial art? It is my friend, Londale. I just love this guy and how amazing the lesson. He is still emptying his cup. I just love this guy. Well, what I want to share with you is one of the principles that Londale taught me in early 2002, during one of my testing sequences in Krav Maga. On this particular day, I recall being just exhausted. Londale demanded from his trainers, in particular, those people that were going to go back to their departments and teach Krav Maga. He demanded excellence. Every repetition that we performed had to be performed with 110% commitment. Anything less than that, you would not pass his course because Londale believed in the law of repetition. He knew that we had to repeat the desired behavior perfectly during training and so that it was available for us during times of fear, stress, uncertainty, fatigue on the street when our life really depended on it. And perhaps more importantly, we could then teach the skills that we had been repeating to our fellow officers and fellow deputies. Well, on this particular testing sequence, I was so exhausted that when Londale was close to me and when he was watching me perform the techniques, well, I really brought it. I gave 120%. Yet, when Londale turned to watch the officers or deputies next to me, I turned it down a little bit. I was trying to conserve some energy to make it through this ruling test. Of course, Londale catches on to what I’m doing. He stops class, he pulls me aside and here is what Londale says to me. He says, “You know Greg, there are two types of pain in this world. 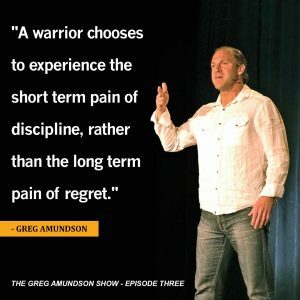 There is the short-term pain of discipline and the long-term pain of regret.” And he says, “What type of pain are you experiencing right now?” Ouch! He called me out in a big way. What I’ve been doing is I had then lacking the discipline to go 120% on every repetition. I was going to regret that should my life depend on it. Oh, I just feel so blessed for that moment in time because what Londale was teaching me in that moment, my friends, is that we have to repeat the desired behavior, the desired thought process, with 100% commitment every chance we get because we never know in what moment we will be called upon to exhibit our established competency in the skill or the thought process that we have been repeating. So I just can’t emphasize enough how important this first law of repetition is, my goodness. In fact, to really bring this point home, let’s go into the Bible. Let’s look at one of the amazing moments in the life of Christ when Christ just knocked it out of the park, when he taught the power of infinite numbers of repetition. On one particular day, during the life of Christ when Christ was ministering on the power of forgiveness, one of the apostles said to Christ, “Christ, how many times should I forgive my brother? Seven times?” Christ replied, “Seven times seventy.” The reason that’s significant is that in the Scriptures, seven is the number of completion and a zero added to that same number is infinity. Wow, imagine that! Christ said seven times, no, no, no, no, no. You may need to forgive you brother in infinite number of times, meaning that you may need to repeat the behavior of forgiveness an infinite number of times. The reason I just love that story from the life of Christ in the context of understanding the law of repetition is you and I as warriors, we have to be prepared to continue to repeat the desired behavior, the desired way of thinking every day for the rest of our life. That’s the nature of the warrior, to wake up every day, to empty our cup, to empty our mind, to step into the field of battle, and to be ready to be at our very best. You see, this is the manner which my dear friend Mark Divine teaches when he proposes that deep inside, you and I, my friends, in any given moment, there are two dogs or two wolves that are starving for our attention. One of these dogs, as my dear friend Mark Divine teaches, is our greatest ally. That is the dog of courage. The other dog is the dog of fear. We have to continually feed our courage dog by repeating the desired process of right thinking, because, you see, these dogs whether it be courage or fear, the type of nutrition that they are starving for is our attention, and we best direct our attention through our thinking. So by feeding the dog of courage, we think through the context, through the lens, through the perspective of positive expectancy, positive self-talk. We repeat to ourselves over and over and over and over again, positive affirmation, positive mantra, Bible verse. In any way that we can, focus our mind through focusing our thoughts on to the dog of courage. Whatever it takes, that is the direction that we march. Those are the drums that we march to, that’s the rhythm of our life, feeding that dog of courage by repeating in our mind positive affirmation, positive mantra, Bible verse. Well, my friends, I want to share with you now as we begin to wrap up this episode, I want you to share with you the next law, and that law complements the law of repetition because this is the law of order. I think it’s best to introduce the law of order by sharing with you a story. This story happened to me and Coach Glassman. Coach Glassman gets the credit for helping me understand and come to love the law of order. In the early days of CrossFit between 2002 and 2004, Coach Glassman used to just love to travel around the country teaching a course that he had established called the CrossFit 101. This was two or three-hour seminar conducted exclusively by Coach Glassman in which Coach Glassman would answer the question, “What is CrossFit?” Well, Glassman used to like to arrive at the location he was going to teach at the day before the event started because Glassman really liked to get a perspective and a boots-on-the-ground, analysis of the location he was going to teach at. In addition, he used to love to meet with the affiliate owner and the athletes that were training at the gym he would be speaking at the next day. And what Coach taught me in that moment, it’s just profound. What he taught me essentially is the law of order. You see, in the universe that God created, everything counts. God didn’t waste any resource in the creation of the universe. Everything counts, even the little things count in our life my friend because a lot of little things repeated make a big thing. And that is how we begin to join and yoke and see the relationship between all of God’s law and in particular the law of repetition and the law of order. In many respects, this is what the author Stephen Covey was teaching when he told in his book, The Seven Habits of Highly Effective People, he told a story about the power in putting first things first, knowing how to prioritize what is more important over what is least important. And God makes it abundantly clear. What is the most important? God, seeking God first. When we seek God first, everything else is added to us. Everything else will work out in a pattern for good when we put God first. Part of putting God first is understanding the nature of God, part of understanding the nature of God is to understand God’s word, and part of understanding the Word of God is understanding the law that God has created. Well, my friends, I really, really do hope that you have enjoyed today’s episode. It was such a pleasure and honor to spend this time with you. I pray that God would bless you and keep you safe, and I will speak with you soon back here on our next episode together of The Greg Amundson Show. Take care.